Derrick Bird, who shot dead 12 people in Cumbria, had held a firearms licence for 20 years. The taxi driver - who also injured 11 others before turning the gun on himself - had a shotgun certificate and a firearms licence for weapons for pest control and to go clay pigeon shooting. In the official police review of the tragedy, the country's top firearms licensing officer has said that Bird fulfilled the necessary requirements for issuing the licences. But are there areas left that could be further tightened? The UK has some of the toughest gun control laws in the world. If you want to own a gun, it is very difficult to do so. In short, it has been designed to put as many barriers in the way as possible and to assume the worst, rather than hope for the best. In the United States, you can declare that it is your constitutional right to bear arms. But in the UK, you need to spend hours filling in paperwork and proving to police officers that you are not a danger to society. The system is administered by police forces in each part of the UK and in England, Scotland and Wales there are separate licences for shotguns and for other firearms. According to the most recent figures for England and Wales, there are 138,728 people certificated to hold firearms and they own 435,383 weapons. There are 574,946 shotgun certificates which cover 1.4 million shotguns. Police chiefs can revoke certificates if they conclude that the holder can no longer be trusted. In 2008-09, almost 1,300 certificates were revoked. Getting a licence is a long and complicated business. 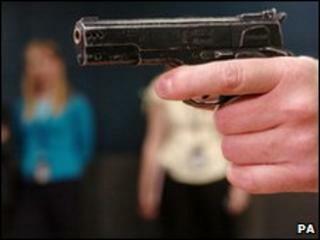 Every stage of the process is designed to reduce the likelihood of a gun falling into the wrong hands. It starts with an application form which asks specific questions about why the individual wants a gun, telling them they need to show "good reason". The criteria are tougher for firearms than shotguns because weapons that fire bullets must only be used for specific purposes in specific places. These would include deer stalking or sports shooting on an approved range. In contrast, shotguns tend to be used in more general rural circumstances, such as by farmers who are protecting livestock from foxes - and police recognise that landowners need guns for pest control. Independent referees provide confidential character statements in which they are expected to answer in detail about the applicant's mental state, home life and attitude towards guns. Officers check the Police National Computer for a criminal record and they speak to the applicant's GP for evidence of alcoholism, drug abuse or signs of personality disorder. Social services can also be asked for reasons to turn down an applicant. Finally, senior officers must be sure that prospective shotgun holders have a secure location for the weapon, typically a dedicated gun cabinet. Each certificate is valid for five years. The review of the licensing laws makes clear that there are two separate issues for public debate. Do you have any knowledge of any significant difficulties the applicant has in relationships with his or her immediate family... given that a firearm or ammunition may be available in the household? The first is whether there is any public, political and policing appetite for more gun control per se. Given that controls are pretty tight, police chiefs are spelling out that further restrictions would be a fundamentally big argument to be had - and one for Parliament and the people. They argue that that if the public want an "absolute prevention" of murders and assaults, there is no point tinkering with the way licences are issued. This becomes a question of whether anyone, anywhere, can hold a firearm at all. Assistant Chief Constable Adrian Whiting, the Association of Chief Police Officers' lead on licensing argues that the "hard truth" of certification and checks is that they only minimise risk and cannot eliminate it. So that leaves the second issue of monitoring and oversight. What's become clear to police in recent years is that there have been cases, particularly suicides, where doctors have not known that a patient held a firearm. The answer sound simple: make sure the police tell them. But for years the NHS has remained unconvinced that it could hold such potentially sensitive information securely. That may now be changing. Police chiefs believe they can devise a system with the NHS to dynamically share information about ownership and mental state. But the system may require Parliament to legislate to allow private data to be carefully shared between the two public bodies, for this single, particular purpose. The reality is that gun laws in the UK have developed piecemeal since the end of WWI in response to threats as they are perceived to emerge. The two most important laws came in the wake of two national tragedies. Michael Ryan's massacre of 16 people in Hungerford in 1987 led to the banning of all modern semi-automatic rifles, the range of guns that can be fired rapidly without needing to be reloaded. Nine years later, Thomas Hamilton killed 16 schoolchildren and their teacher when he opened fire at a school in Dunblane. Parliament banned all handguns and there is now a mandatory five-year jail sentence for possession. Since then, we have seen moves against criminal conversion of imitation firearms - a tactic used by backstreet engineers working for gangs.